Address: The corner of Martin St. and Boynton St. (just east of Hank Aaron Blvd). The actual address is 213 Haygood Avenue, Atlanta, GA 30315. Features: Oh my goodness…sooo many things to do here! Let’s see, when you walk into the park area, you are walking along a cement walkway with picnic pavilions on your left and a huge greenspace (with very luscious grass I might add) on your right. You are underneath photovoltaic solar panels, which act somewhat as a shaded structure. 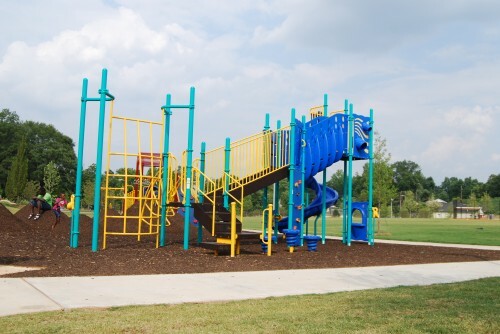 As you continue walking, you’ll see swings to your left (both big kid swings and baby swings), then an area for younger children: a few bouncy ride things that look like Clifford the dog and a tractor play area with a slide. The you come to the “natural playscape” with pretend rocks you can climb and tunnels you can go through. There are these CRAZY twirly things that I suppose you are supposed to hang from, but I have only ever seen kids sitting 6 feet above the ground on this merry go round type thing spinning round and round (seems awfully dangerous to me!). Of course, the main attraction is the splashpad. Only open during the summer, this is a welcome addition to this neighborhood and surrounding neighborhoods. This playground is not over yet. Two more jungle gym type things with slides, monkey bars, rock walls, climbing structures, you name it, it’s got it. There is this very unique area with mounds of packed mulch that you can climb on (kind of like mini hoodoos if you’ve ever been to Utah) and jump off of with ease. I have never seen that before (and I’ve been to A LOT of playgrounds!). Finally, there is a HUGE, COMPLETELY SHADED music area with probably 4 marimba things, drums, rain makers. Just amazing!! The splashpad will close October 1st for the fall/winter per the city of Atlanta Parks and Recreation Department. Seating: lots of benches and picnic tables. The benches are this crazy material that doesn’t get hot either! Safety: This neighborhood is a little bit sketchy in my opinion, but I have never felt unsafe here. I would not leave anything visible in the car. Cons: This is an amazing playground. Just amazing. I think the only con is that the lack of shade on the play structures. Like I said previously, some people might not want to go into this neighborhood for a playground, but honestly, it is worth the drive. I am crazy about safety and I wouldn’t go to a playground that I didn’t feel safe at, and I feel fine at this playground. There are lots of kids running around. Just watch your stuff (as in any playground). Overall Assessment: 5+ stars. Amazing. Fantastic. This is a welcome addition to the area and the idea that it’s attached to the Beltline…super!! D.H. Stanton is the first energy-cost neutral park in the City of Atlanta, and among the first in the country. I wasn’t expecting much for an inner-city park in this neighborhood, but it’s really extra nice, with meticulous landscaping featuring miniature hills formed from mulch and rows of flowering plants; colorful playscapes; and, as a centerpiece, a splashpad with an interactive water sculpture designed by local artist Robert Witherspoon. Long-term the park will become part of the Atlanta BeltLine, the planned 22-mile necklace of parks, trails and transit around the city. I suppose that at the end of the Beltline multi-year plan, this park won’t be off the beaten path, but will be a vibrant park of the Beltline and everybody will come. A little history of the park: In 1999, officials learned the site had been used as a landfill following a then-little girl’s injury. The girl’s injuries stemmed from burns caused by methane gas seeping up from the ground.